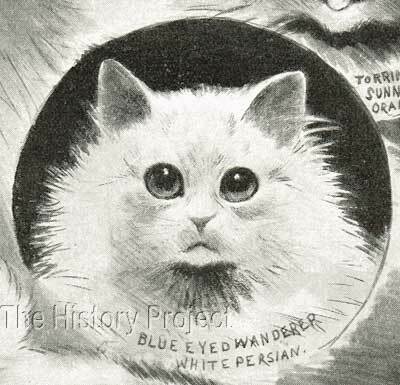 In the world of White Longhairs at the turn of the twentieth century, there were three White Persian males who played a dominant role in the breeding of blue-eyed whites in what was essentially a veritable triumvirate. Chief amongst these was Mrs. Champion's 'White Friar', who had been rehomed with Mrs. Finnie Young in the north, whose lines, when combined with those of 'Ch. Crystal' produced some of the finest white Persians coming out of England at that time. Second, in this triumvirate, was Mrs. White-Atkins's 'White Knight', (aka The White Knight of the Midlands), a massive, broad-skulled male who was seen by many as an appealing alternative. In a number of cases, he was used as an effective outcross for queens from 'White Friar' lines. From a purely breeding perspective, the third male from this triumvirate, was Mrs. Pettit's 'King of the Pearls', who was based in the south; the prime progenitor of a dynasty of other 'Pearls' to come from this cattery. Among his best known progeny were the likes of the lovely 'Piquante Pearl' and 'Beautiful Pearl'. This model however, changed, when viewed from a show perspective; with Miss Ellen Harper's 'Blue-Eyed Wanderer' often replacing Mrs. Pettit's 'King of the Pearls' in the triumvirate. 'Blue-Eyed Wanderer' was a successful show cat, of impressive structure and he offered yet another alternative outcross for those wishing to specialise in the highly-competitive arena of the blue-eyed white longhair. 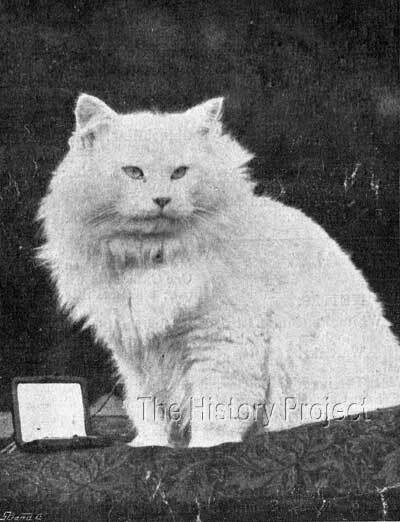 Ever since Mr. A.A. Clarke had exhibited his 'Tim' and 'Miss Whitey' in the 1880s, the White Longhair had enjoyed a pre-eminence in the show ring. Mrs. Cunliffe Lee's unforgettable 'The Masher', known for his size and magnificent coat had left a lasting impression on exhibitors, when he took the cat world by storm at the Crystal Palace Show of 1890. An enthusiastic fancier, Mrs. Lee had paid £21 for this remarkable cat, which also had the grandest of blue eyes. The die had been cast, and there was no shortage of fanciers who wanted to follow along a similar path. Miss Ellen Harper, was already well-established in the cat world before she took on White Persians. She began around 1891 and had previously taken a specialty interest in white shorthairs with blue eyes, and had carried off numerous prizes with these from the Crystal Palace with charming specimens of that variety. She then broadened her horizons and took on longhairs, again specialising in mainly whites. One of her earlier stud males with a high profile as a third-tier foundation cat was her Blue, 'Waterloo' who was never shown due to having an injury to his ear. 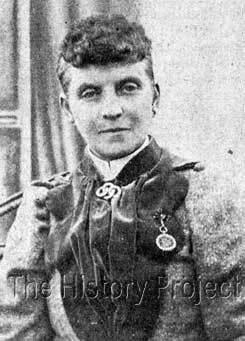 Having formerly resided in Brighton, she had moved to Hayward's Heath where she was the philanthropic proprietor of a Home for Cats. Her intense sympathy with cats, and her lengthy experiences of their ways and their ailments, made her Cat's Home extremely popular among the fanciers and owners of cats in the south. 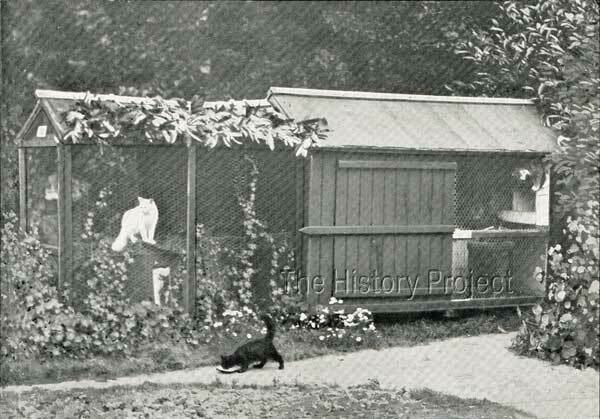 Side view of one of the cat houses at Miss Harper's Cattery, Briarlea, Hayward's Heath. 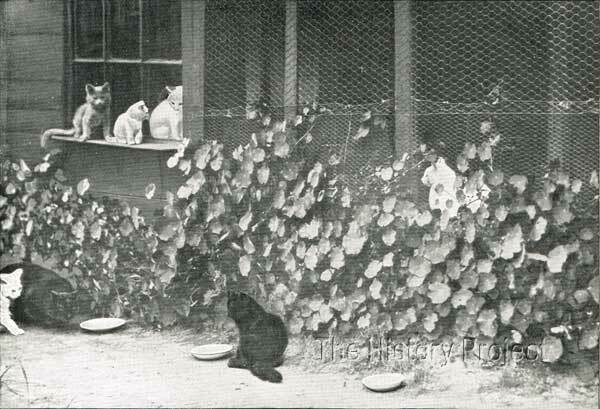 Another view of Miss Harper's Briarlea catteries, Hayward's Heath. Due to his 'unknown' parentage, there are no siblings of record for 'The Blue-Eyed Wanderer'. However, he was shown very successfully as indicated by Miss Simpson. 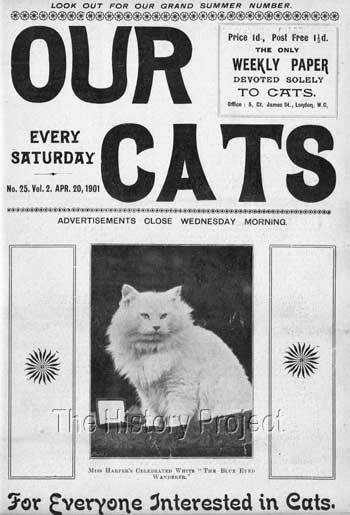 Known wins include: 1st, at the Crystal Palace, 1900; 1st, at Harrogate, 1901; and 1st, at Midland Counties Cat Club, 1902. But, there were many more. The following are extracts taken from a number of show reports in the latter part of 1900. Most of the registrations of progeny sired by 'The Blue-Eyed Wanderer' appear to have been between 1901 and 1906. However, the records that are available are clearly incomplete, which is often the case. In a litter born 25th April, 1903; a blue-eyed white female bred by Miss Harper, registered as 'Heath Lily', and sold to Mr. Godfrey Shaw. 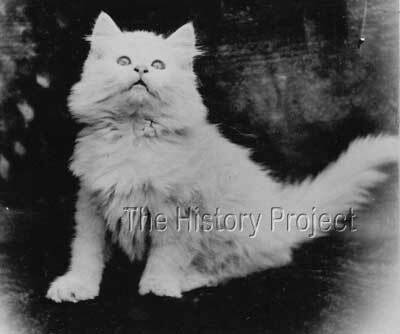 Another blue-eyed white kitten out of 'Water Lily', with date of birth unknown, was 'White Cherub' who is shown in the image below. This appears on a breeders postcard, in the archives of The Harrison Weir Collection and in Miss Harper's own handwriting on the reverse, the kitten is clearly identified as 'White Cherub', by 'Blue-Eyed Wanderer' out of 'Water Lily'. Blue-Eyed Kitty is also shown as the dam of 'Blue-Eyed Coral' (CFA 57 v1)�? a blue-eyed white female bred by Miss Harper and exported to Mrs. H.G. Dykhouse, of Grand Rapids in the United States. 'Coral' was born March 5th, 1906 and her sire was 'White Hyacinth',(NCC:4872) a blue-eyed white son of 'Blue-Eyed Wanderer' and 'Putey Putey'. The above list is not exhaustive, but does give an indication of Wanderer's popularity as a stud, and his ability to consistently produce blue-eyed whites to order! Detail from Interpretative sketch by Louis Wain. We must surely admire the tenacity and studious progress of Miss Ellen Harper in venturing into the world of the blue-eyed White longhair and achieving considerable success against what must have seemed at times, to be almost insurmountable odds. No doubt her prior experience as a breeder of blue-eyed white shorthairs, gave her a good grounding, and in running a Cat's Home, she would have gained valuable insights into feline ailments through careful observation. Through this she would have built up a wealth of knowledge, allowing her to detect and/or diagnose any potential risks early on, thereby giving an opportunity to intervene before they could take hold. In short, after hard work and study in one breed, she transferred her knowledge to another and executed a successful campaign, which resulted in consistent wins with numerous cats. This reinforces two valuable lessons in breeding. One, that it pays dividends to study first and gain knowledge before diving into a breed; and two, that you need to be both ready and able to recognise and take up a valuable opportunity when it arrives, possibly unexpectedly. "I should like to see the surplus proceeds from the various cat shows devoted to the humane purposes of aiding the different Homes for Stray Cats, as is done already in America." Such a comment would have no doubt gladdened the heart of Harrison Weir upon reading it, and it is easy to imagine him responding with a resounding "Hear hear!"